The Fédération Cynologique Internationale is a truly global organisation and, as well as working towards a collective goal, it operates as a body where people can meet with the shared aim of exchanging ideas and experiences but without paying the slightest attention to their cultural, geographical, political or religious differences. 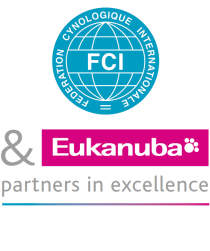 We come together under the banner of the Fédération Cynologique Internationale to protect all dogs equally, no matter where they come from or where on Earth they live. New project launched in Thuin, World Capital of Dogs: dogs visiting nursing home residents! Inspired by wonderful initiatives carried out by several FCI members all over the world (see references below), the FCI suggested a meeting with Mrs Michelle Dutrieux, General Director of the City of Thuin, and Mr Luc Caron, Director of the local nursing home Le Gai Séjour. The purpose was to introduce the work carried out by the Belgian non-profit organisation Un Chien pour un Sourire (in English, A Dog for a Smile) which started 10 years ago to visit children in a hospital in Liege. The idea is to transfer the know-how of this non-profit from the field of visiting dogs with children in hospital (CGR Citadelle in Liege) to the field of nursing home residents (Le Gai Séjour in Thuin). This team has a ten-year experience and is led by a nurse and a canine instructor, both experienced and deeply involved. The meeting was very productive and all the participants showed not only interest, but also enthusiasm. The next step is to gather Thuin’s CPAS (Public Centre for Social Welfare), the nursing home’s management and the non-profit organisation to start laying the ground to this initiative, which would be pioneer in Belgium. It would be so nice to have it happen in Thuin, the city hosting our federation! from left to right Marie Luna Durán (FCI Marketing and Public Relations Manager), Philippe Blanchart (CPAS President and in charge of animal welfare at the City of Thuin), Yves De Clercq (FCI Executive Director), Michelle Dutrieux (General Director at the City of Thuin) with three residents of the nursing home welcoming the Irish Setter Keylinn. On February 21st, Philippe Blanchart – in charge of animal welfare for the City of Thuin – organised a press conference to inform about the project. The full PowerPoint presentation is available here. Good luck to the project!